When the 1935 F-20 tractor arrived on the farm, it looked like a brand new tractor. Our Dryden Township farmer could scarcely believe that it was the same tractor. As a 1935 F-20, the tractor originally had come from the factory painted battleship gray in color and, in the years since its original purchase, the tractor had become quite rusty looking. Now however, the tractor was as red as any of the new letter series tractors. The tractor really looked good with its new decals. Thomes Bros. stated that they had re-conditioned the tractor. However, the “re-conditioning” of the engine was basically just a tuneup. Nonetheless, the F-20 started very easily by crank and seemed to exhibit sufficient power. Consequently, it looked and felt like a new tractor. This was our Dryden Township farmer’s first farm tractor. He hoped the F-20 would replace his Belgian work horses in a number of tasks around the farm. Thomes Bros. Hardware and Implement, the International Harvester dealership of Arlington, Minnesota. Although spring field work was still a few weeks off yet when the tractor first arrived on the farm, our Dryden Township farmer began to use the tractor for a number of “wintertime tasks. He adapted much of his horse drawn machinery to allow it to be used with the tractor. He shortened the tongue on his horse-drawn Minnesota Prison Industries manure spreader to make the spreader into a tractor-drawn spreader. The tractor was now employed each morning hauling the barn manure to the field. Every winter, usually in February or March, he would shell out all the ear corn that he had stored in his big “double” corn crib. As noted previously, this year the shelling of the ear corn in his corn crib had been delayed until April of 1940 because of the bad weather. (Ibid.) Part of the shelled corn had been stored away in the granary and in the bins over the alleyway of the double corn crib. Also as noted previously, once he had filled the granary, he was assured of enough corn to feed the cows, hogs and chickens for the entire next year. The remaining shelled corn could then be sold to the grain elevator up town in Arlington. (Ibid.) The money received from the sale of this corn was used make a big payment on the new farm machinery. A four-wheel horse-drawn manure spreader which has a shortened tongue for use with a tractor. Now with all the ear corn shelled, our Dryden Township farmer employed the 1935 F-20 on a number of other “wintertime” chores. The feeder pigs were now starting to eat a great deal more feed as they were being fattened and be readied for market. Consequently, he needed to fill the feed bin in the hog house every two weeks or so with fresh ground feed. Now instead of the old “hit and miss” single cylinder stationary engine, he used the F-20 tractor to power the hammer mill. He also changed the screen on the hammer mill from the fine-grind screen, used for grinding shelled corn, to the coarse-grind screen. He then attacked the huge pile of corn cobs that had been left by the shelling crew when he shelled out the corn crib. These ground corn cobs were stored in another bin of the hog house. Whole cobs could be used as bedding for the sows, but the ground corn cobs made excellent bedding for the baby pigs and for the chickens. He was surprised at the amount of wintertime work that he was able to complete simply by using the tractor. The tractor was making money by saving him time and he was not even in the fields yet. Grinding pig feed in the alley way of the corn crib is a wintertime chore that is easily accomplished with a farm tractor. Here farmer has probably opened the chute to an overhead bin in the corn crib above the alleyway to let some shelled corn or oats fall onto the cement floor of the corn crib where he can scoop it up and shovel it into the mill. He has also opened the doors on either end of the alley way wuch wider than is necessary for the belt in order to blow away the dust that is created by the grinding process. Now as the spring weather continued to warm, our Dryden Township farmer anticipated the beginning field work. He was anxious to get into the field with the new two-bottom Model No. 8 “Little Genius” tractor trailing plow. The plow with its bright red frame, two royal blue moldboards and cream white steel wheels in the front and a cream white rear trailing wheel was currently sitting in his machine shed. The 14-inch bottoms on the Little Genius trailing plow were bigger than the bottoms of any sulky plow, our Dryden Township farmer had ever used with the horses. Spring plowing with an F-20 and a two-bottom Little Genius plow. While he anticipated the spring field work, his wife was busy with the two flocks of chickens, they had on their farm. The chickens were in “her domain” in their farm partnership. The hens that currently occupied the hen house on the farm were the old laying hens that were currently producing eggs. These eggs were sold off the farm as a “cash crop.” (See the previous article in this series, for a description of this cash crop.) The winter months, just past, had been the laying flock’s peak production period. Now as spring wore on their egg production was falling off slightly. Our Dryden Township farmer’s wife knew that the old hens could continue to lay eggs at a reduced level for another year. However, she knew that it was far more profitable to her to sell off the old hens and replace them with a fresh flock of layers each year. This fresh flock of layers was also being raised on the farm. Wintertime with a large accumulation of snow meant that more supplemental grit and oyster shells needed to be fed to the laying hens. As the spring arrives the young baby chick begin to grow feathers and lose their fur. Following a cold snap in mid-April, the days started warming up to 70°F. As the warm weather of spring arrived, the baby chicks in the brooder house became too big for the small quarters of the small brooder house. The nights were warm enough on a consistent basis that the brooder stove could be turned off and dismantled and stored away for another ye ar. With the brooder stove gone, there was room to assemble the small roost in the brooder house. The chicks were now in that awkward stage when they were losing their yellow fur and they were sprouting their first white feathers on their wings and tail. Now they would begin to exercise these feathered wings by flopping their wings as they jump up onto the newly installed roosts in the brooder house to sleep all night. The feathers on the body would bloom later. The head was the last part of the chick to feather out. During this time they would tend to look like little “vultures” with naked necks and heads. As the spring weather continued to grow increasingly warm, our Dryden Township farmer’s wife would open the little door at the end of the brooder house which opened up onto the little wire porch . The wire porch was enclosed by wire on the bottom, top and sides. This enclosed wire porch allowed the chicks to become accustomed to the outdoor weather and to enjoy some sunshine while protecting them from predators. Additionally, the floor of this porch was lifted off the ground approximately six inches. This allowed the droppings of manure to fall through the wire floor to the ground below. Thus, the wire floor protected the chicks from another danger—their own raw manure. The droppings of raw manure would fall through the wire floor and onto the ground. Thus, the young chicks were kept from having direct contact with the raw manure. This would significantly reduce the chick’s exposure to a wide range of “enteric” or digestive tract bacterial diseases. The most common of these diseases is coccidiosis. From year to year the brooder house and the wire porch would be moved from location to location around the brooder yard. This would tend to break the life cycle of many bacteria by avoiding concentrations of manure in one place. The chicks were let out into an enclosed “wire porch” during the warm daytime hours. However, in the evenings, our Dryden Township farmer’s wife would chase the little chicks back into the brooder house out of the wire porch and close the little door behind them until morning. Later as the nights of late spring became warmer and the chicks became more fully “feathered” and, thus, protected from the cooler weather, the small doors to the wire porch would be left open all night. The chicks develop feathers on the body first and later on the head. At this stage they can look like little “vultures” with bald heads. Ever since they had been introduced to the brooder house, our Dryden Township farmer’s wife had been watching the young flock for signs of coccidiosis. She watched carefully for any signs of loose or bloody droppings in the manure. Symptoms of coccidiosis were a loss of appetite and dehydration. The chicks would eat less and drink more water. Coccidiosis left uncontrolled could spread rapidly throughout the entire flock and kill a great number of the young chicks. The best defense against the spread of the disease was to continue increasing the “living space” of the flock. To avoid disease the available space for the young chicks must be expanded as they grow. Soon the chicks have outgrown their entire brooder house and a porch must be made available to them with a secure roof to avoid dogs, foxes, hawks and other predators. Increasing the living space would have the effect of decreasing the flock’s exposure to concentrations raw manure. Thus, as the month of May wore on, the chicks in the brooder house became too big for the small quarters of the brooder house even with the additional space of the wire porch. Toward this end, the front doors of the brooder house were opened during the day and the young chickens were allowed the freedom to roam the entire homestead except the garden. At first, the chickens all seemed to return automatically to the brooder house at night to roost. However, each day, they would explore further and further out into the homestead away from the brooder house. Eventually they began roosting in the trees around the homestead at night and ceased returning to the brooder house at night altogether. As summer approaches the “baby chicks” now full-grown chickens themselves abandon the brooder house altogether and start roosting in the trees around the farm during the nights. Here they sleep save from predators. Come late June, or when the chickens were about 13 weeks old, our Dryden Township farmer and his wife could begin decreasing the size of their young flock by butchering some “spring fryers.” As the young flock grew, they began laying “pullet eggs” (the first small eggs that young hens lay when they begin first begin laying eggs). During this time, our Dryden Township farmer and his wife knew that some of the hens would reveal themselves as infertile or “culls.” These culls would be butchered. During this time, our Dryden Township farmer and his wife would have many fresh chicken dinners. Additionally, they would also cook and preserve (or “can”) the meat from a great number of the chickens. This would make many chicken pot pies, chicken hot dishes and chicken soups in the coming winter. Spring fryers make some very good eating. Some time in late March our Dryden Township farmer’s wife had divided the cockerels (male chicks) had been divided into two groups. She reserved about 50 of the cockerels which would become “breeding roosters” for the laying flock. However, the rest, she had “sexed” or “caponized” (surgically removed the testicles of the cockerels). She did this when the cockerels were between 3 and 8 weeks of age. At first, the capons would grow at the same rate as the other chickens. However, at the age of eighteen (18) weeks of life, the capons began gaining weight at a much faster rate than other chickens. Just two weeks later, after about twenty (20) weeks of life, the capons reached their full maturity and were ready for butchering. At this time the capons weighed about twice the amount of non-caponized cockerel—delivering four (4) to eight (8) pounds of meat to the table as opposed to the 3 ¼ to 4 ½ pounds for an ordinary roaster. Additionally, the meat of the capon was also much more tender than ordinary roasters. By design her capons reached their ideal weight during July—the start of threshing season. Our Dryden Township farmer’s wife butchered the capons at this time. The wives of the threshing crew were responsible for the large dinners for the threshing crew each day as the thresher made the rounds of the neighborhood. Our Dryden Township farmer’s wife used the large capons to prepare her share of the dinners for the threshing crews as she and the other wives followed the thresher around the neighborhood. Thus, the threshing crews were treated to large, tender capons as part of their dinners every day during threshing season. Almost as soon as the oats had been threshed and stored away for the winter, it was time to fill silo. Once again the neighborhood cooperated in this activity and once again the wives of the crew prepared large dinners. By the time, our Dryden Township farmer’s wife had finished preparing the food for all the dinners during silo filling season, she had butchered all the capons and some of the cull hens. Now, as late August gave way to September, the young chickens were becoming a nuisance as they roamed the entire homestead. The garden gate had to be kept closed and fastened or else the young chickens would enter the garden and begin to eat the garden vegetables. The door to the garage needed to be kept closed or the young chickens would roost on the car and leave their droppings on the seats of the car. Pullet eggs were found in the haymow of the barn and in the feed room in the hog house and just about everywhere. It was getting to be time to sell the old hens to Noacks and clean out the chicken house and confine the young chickens to the hen house. Accordingly, one bright morning in September, the truck from Noacks arrived on the farm and backed up to the hen house. A large chute was assembled in the door of the hen house. The chute was enclosed on the top and all sides to prevent any of the old hens from escaping. There only openings in the chute were at either end of the chute. The entire flock of old chickens were herded into the open end of the chute which was inside the hen house. The other end of the chute, located outside the hen house, had an opening which faced straight down. This opening was covered by a trap door. A chicken crate was positioned under this trap door. As the old chickens made their way up the chute, the trap door was opened and chickens flowed out of the chute into the chicken crate. About fifteen hens filled the chicken crate. Then the crate was latched shut and the loaded crate was placed on the truck. Another empty crate was removed from the truck and placed under the chute and filled with fifteen more old hens. Soon all two hundred (200) old hens and roosters from the chicken house were loaded in crates and loaded on the Noacks truck. The truck then drove out of the yard and out onto the road for the short trip to the Noacks plant uptown in Arlington. There, the old hens would be butchered, cooked and canned. Canned chicken was destined to end up as a chicken soup or as part of some other processed food and sold to wholesale grocery stores. In the late summer and fall of the year trucks or wagons full of old hens f,rom neighboring farms, arrive at Noacks in Arlington, Minnesota to be processed into canned chicken meat. Once the hen house was empty, our Dryden Township farmer and his wife set about cleaning the hen house to make room for the young flock of chickens. Accordingly, the next morning after the old chickens were gone following the morning milking chores, our Dryden Township farmer drove the F-20, pulling his Minnesota manure spreader from the barn over to the hen house. The manure spreader was already partially full of manure from the daily cleaning of the gutters in the barn. It did not take long to fill the rest of the manure spreader with some of the litter from the now vacant hen house. Once the manure spreader was full, our Dryden Township farmer started the tractor and headed to the field pulling the manure spreader. A restored horse-drawn manure spreader. During the summer season the disposal of manure always presented problems. With crops planted from fence row to fence row in every field, it was quite hard to determine where to spread the daily manure from the barn. Windows of opportunity were opened after each harvest on the farm. For instance, after the hay was cut and removed from the hayfield, our Dryden Township farmer would spread manure on the stubble in the hayfield. However, this was only a temporary fix. The second cutting of hay was growing up under the hay stubble and so after a few days, or so, he did not like to be out in the hayfield with the manure spreader trampling down his future second cutting hay crop. Immediately after storing away the first cutting of hay, it was time to harvest the oats. Lifting an entire wagon load of hay into the hay mough of the barn with slings. Power for this operation is being provided by the team of mules walking toward the camera on the right side of the picture. Once the oats were cut and shocked, our Dryden Township farmer began spreading the daily loads of manure on the stubble ground in the oat field. However, once again, this was only temporary solution. According to the pattern of crop rotation our Dryden Township farmer had established, this year’s oat field would become next year’s hay field. Accordingly, last spring our Dryden Township farmer had planted the oats and hay together as companion crops. As anticipated, the oats grew very fast, had ripened and then had been harvested while the underlying hay was still preoccupied with forming a root structure. Only now, with the oats gone, did the underlying hay plants begin concentrating on their above-ground growth. As the new hay began to reach this stage of development, our Dryden Township farmer wanted avoid trampling down this new growth for fear of ruining next year’s hay crop. Consequently, only a limited of manure could be spread on this field. Sometimes during the summer growing season when there was no where else to turn, he would spread the manure on the pasture. Of course, the cows themselves left manure on the pasture as they grazed, but the daily delivery of manure from the barn would bring much more manure material to the pasture. This made parts of the pasture entirely undesirable for the milk cows until the manure was completely decomposed or incorporated into the soil. Clearly, spreading the manure on the pasture should be the last resort. However, by August he had filled silo. The green corn that he had harvested to fill the silo had come from the northern 1/3 of the corn field. Thus currently, the end rows on both ends of the field and the northern 1/3 of the corn field had been reduced to only corn stubble. This was the place that our Dryden Township farmer could now use to spread his daily manure. Now in September when he took his Minnesota manure spreader to the corn field with loads of chicken manure from the chicken house, he spread this manure on the stubble on the northern 1/3 of the corn field. Composition of fertilizer value of each of the manures of farm animals. This corn field was the very field that needed the chicken manure the most. Growing corn had depleted the soil of this field of a great deal of nitrogen. The chicken manure that our Dryden Township farmer was spreading on the corn stubble would replenish a large part of the nitrogen that the corn had taken from the soil this past growing season. In this sense, chicken manure was worth money. Next spring, according to his crop rotation plan, this field would planted to oats and, as noted above, our Dryden Township farmer would simultaneously be planting an under-crop of alfalfa and clover—good legume plants. Two years hence, this field would be his hay field. Legumes would return more nitrogen to the soil of this field. Hopefully, by the start of the fourth season in the crop rotation plan when this field would again be planted in corn, the nitrogen level of the soil would need to be back up to normal again. However, our Dryden Township farmer knew that for any manure to be effective, the manure needed to be incorporated into the soil. Left exposed on top of the ground for even a very short amount of time, manure would lose most of its soil building qualities through evaporation under the hot sun or through runoff following a rain fall. The best way to incorporate the manure into the soil was to plow the ground as soon as the manure was spread. In this regard, not only did the corn stubble offer a good place to spread the chicken manure, but this ground could be plowed immediately after the manure was spread. Turning chicken manure into the ground by plowing would speed the incorporation of the manure into the soil and would prevent the loss of nitrogen that would occur if the manure was allowed to lie directly on top of the ground, exposed to the sunlight and rain. Additionally, our Dryden Township farmer knew that his neighbors driving along the road at the far end of the corn field would also appreciate the fact that he covered up a source of smell. Our Dryden Township farmer knew that the smell escaping from the manure smell was an expensive loss. The ammonia smell of chicken manure was actually nitrogen evaporating into the air and this nitrogen was being lost to the soil. Time is of the essence when incorporating manure into the soil rather than leaving it on the surface of the ground. Every day that was allowed to pass before plowing the manure under the ground meant a substantial loss of nitrogen from the unincorporated manure. Consequently, after hauling the last load of chicken manure from the hen house to the field, he parked the manure spreader and unhitched it from the drawbar and drove the F-20 tractor over to the lean-to building where the No. 8 Little Genius plow was parked. Our Dryden Township farmer knew, ideally, that when plowing, there should be a straight line between the center of draft on the tractor (a position in the exact middle between the rear wheels of the tractor under the rear differential of the F-20 tractor) and the center of load on the plow (a spot on the rear bottom of the two bottom plow three-and-a-half (3½) inches to the left of the center of cut of the plow bottom—the line between the two bottoms). Under ideal conditions, when the plow is hitched to the center hole of the drawbar, this line of draft would be absolutely straight and there would be no power wasting “side draft.” Our Dryden Township farmer recognized that side draft reflected itself in a tendency of the front end of the tractor constantly being pulled to one side or the other. Hitching to a Farmall Model F-20 requires hitching the plow 8 centimeters to the right of center of the drawbar to compensate for the fixed final drives inside each rear wheel which prevents the rear wheels from being adjusted to a narrower or wider rear wheel tread width. However, moldboard plowing with the Model F-20 and the two bottom plow required some compromises with this ideal straight line of draft. The F-20 tractor had rear wheels that mounted on the outside of the two fixed “final drives.” Thus, the rear wheels were, basically, fixed at the width needed for cultivation of row crops. For the job of moldboard plowing, the plow had to be hitched so that the furrow wheel on the plow followed directly behind the right rear wheel of the tractor. Some tractors, like the smaller Farmall Model F-12 tractor of the F-Series of tractors or the modern Farmall Model M and Model H of the new letter-series Farmall tractors now being produced by the IHC, had no final drives. On these tractors, it was easy to position the rear wheels along the rear axle to narrow the tread of the tractor rear wheels so that the right rear wheel of the tractor was positioned directly ahead of the furrow wheel of the plow even when the plow was attached to the center of the drawbar. The rear wheels of the F-20 could not be adjusted, so, pursuant to the suggestion in the Instruction Manual for the Little Genius plow, our Dryden Township farmer placed the twisted clevis in a hole on the drawbar about four (4) to six (6) inches to the right of the center hole of the wide drawbar on the F-20. Then he placed the hook latch on the hitch of the plow in the twisted clevis. Now, he pulled the bright red plow with its blue mold boards and cream white wheels out into the bright sun of the Indian summer afternoon of mid-September 1940. Our Dryden Township farmer noticed, as he pulled the plow out into the yard that, thanks to off-center hitching point on the drawbar, the furrow wheel of the plow was directly behind the right rear wheel of the tractor. However, the off-center position of the hitch point on the drawbar created a deviation to the right in the line of draft from the tractor to the plow. Ordinarily, this would cause the front end of the tractor to pull toward the right. Out in the field, this tendency of the front end of the tractor to pull to the right would mean that our Dryden Township farmer would have to fight the steering wheel all day just to keep the front wheels of the F-20 out of the furrow while plowing. However, IHC had planned for the eventuality that their Little Genius plow might be hitched to any one of a number of models and/or makes of tractor. Consequently, the glossy-black-painted hitch of the Little Genius had been designed as a triangle with three adjustable iron bars. These bars were made of hardened metal with many holes along the length of the bars to allow the triangular hitch to be bolted up in a number of different configurations to match the various drawbars and rear wheel spacings of a number of different tractors. These various triangular configurations were designed to compensate for the lack of “straightness” of the line of draft caused by hitching the Little Genius plow to various tractor drawbars. Our Dryden Township farmer knew that he need not worry about the particular triangular configuration of the plow hitch, because he could see from the Instruction Manual that the plow hitch had already been bolted together in the proper configuration for an F-20 tractor. (This configuration for a two-bottom plow with 14 inch bottoms when attached to an F-20 tractor is pictured at Illustration #18 on page 15 of the 1939 Instructions for Setting Up and Operating the Little Genius Plow.) He had used the new plow last spring to finish up the plowing that he had not completed a year ago and had had no real problems with side draft. Accordingly, he could be sure that the line of draft was as straight as possible when viewed, horizontally (viewing the line of draft from a position above the tractor and plow). Major adjustment of both the horizontal line and vertical lines of draft is accomplished at the triangular hitch on the plow. This is the Illustration #18 in the Setting up and Operating Manual noted in the text above. This is the suggested adjustment of the hitch of a 2-bottom plow with 14 inch bottoms when that plow is pulled by a Farmall F-20 tractor. However, fine tuning is usually needed with any tractor that is regularly used with the particular plow. However, our Dryden Township farmer also knew that the line of draft needed to be straight when viewed “vertically” (viewing the tractor and plow from the side). When viewed from the side of the tractor and plow, with the plow bottoms in the ground, the imaginary line stretched from the point under the differential of the tractor down to the center of load on the rear bottom of the plow now under ground. The plow hitch needed to be attached to the drawbar slightly higher than it was attached to the plow itself. Accordingly, when plowing in the field, the hitch of the plow would slope downward from the tractor to the plow. However, the angle of this slope needed to reflect the degree of slope of the imaginary line of draft as closely as possible—not too steep nor too shallow. If the degree of slope of the hitch was too steep, the front end of the plow would tend to be pulled out of the ground and too much weight would be place on the rear wheels of the tractor. On the other hand, if the degree of slope was too shallow or flat, the front end of the plow would tend to “nose downward” and too much weight would be placed on the front wheels of the plow. This figure shows the correct vertical line of draft to balance the weight between the rear wheels of the tractor and the front wheels of the plow. Either way, a poor job of moldboard plowing would result and power and fuel would be wasted. The triangular hitch on the Little Genius plow could be attached to the frame of the plow by any one of a number of different holes on the frame of the plow. Furthermore, the drawbar on the F-20 was adjustable up and down. Thus, adjustment could be made to the plow hitch and/or to the tractor drawbar to assure the proper slope of the hitch and a straight vertical line of draft. In the spring this drawbar had been set by the mechanics at Thomes Bros. Hardware to the proper height for plowing. However, over the summer, our Dryden Township farmer had removed the drawbar to mount the rear gangs of the mounted cultivator. Now in September, he had to make sure that he returned the tractor drawbar to the height setting for proper plowing. Once this was done and the line of draft between the center of draft on the F-20 and the center of load on the plow was as straight as possible, both vertically and horizontally, then his tractor and plow were exactly “tuned” to each other. This was the ideal condition for heading to the fields. When he first put the new plow to work last spring, our Dryden Township farmer had trouble with the black gumbo soil of his farm sticking to the outside rim of the furrow wheel of the steel-wheeled plow. The soil built up in clumps on the wheel made the wheel bob up and down as the wheel rolled along in the furrow. This tended to ruin the eveness of the plowing job that he was trying to execute. To solve this problem, he had taken an old blown out 6.00 x 16 inch car tire and cut a slit in the back side of the tire and slipped the tire over the steel furrow wheel on the right side of the plow. This tire acted like a boot on the steel wheel and prevented soil from building up on the furrow wheel. Even though it was now fall and the soil tended to be quite dry he left the tire/boot on the furrow wheel. 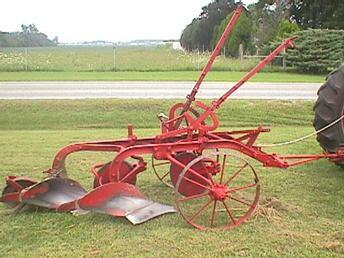 The Wells family’s (author’s family’s) McCormick-Deering 2-bottom plow with 12 inches bottoms is fitted with a boot tire on the furrow wheel side of the plow. This boot tire is to prevent mud building up on the steel furrow wheel. The tire three locations on the serving as a boot is the victim of a blown out tire that needed to have the side wall cut on the side facing the plow in order for the tire to be slipped overt the steel wheel. As he drove the F-20 and pulled the plow out to the field, our Dryden Township farmer was aware that there was one small deviation in the vertical line of draft that was intentionally designed into the drawbar of the F-20 by IHC. The drawbar of the F-20 was attached to the inside front of the final drives on either side of the F-20. However, the location on the final drive where the drawbar was actually attached was near the front of the final drive—ahead of the actual center of the wheel. Thus the drawbar was actually attached to a location slightly ahead of the center of draft of the F-20 tractor. This meant that the front end of the tractor would be pulled slightly downward by a load on the drawbar. This was a safety feature that would tend to prevent the tractor from tipping over backwards if the plow ever hit an immoveable obstruction and the trip release on the hitch of the plow failed to release the plow. Our Dryden Township farmer did not have think about this safety feature. It was an automatic safety feature that designed into his F-20 tractor. The safety feature would operate with no effort on his behalf. However, he was thankful for this feature because he was aware of accidents that had occurred where the tractor operator had been crushed between the tractor and the plow when the tractor suddenly flipped over backwards on top of the plow. The slight forward positioning of the drawbar connection, creating this slight downward pull on the front end of the tractor, would prevent a great deal of these “tip over” accidents. Once he reached the corn field, our Dryden Township farmer pulled the plow across the stubble ground on the northern part of the field to a location in the middle of the manured portion of the stubble. He reached around behind himself and pulled the trip rope, thus, releasing the bottoms to fall onto the ground. He then shifted the F-20 into 2nd gear and released the foot clutch with his left foot. Then he reached forward with his left hand and pulled back on the engine governor control. The engine of the F-20 rose to operating speed, as the plow settled down to its work. As the tractor and plow moved across the field he would make minor adjustments to the lever on the furrow-wheel side of the plow. This lever kept the plow level side to side and level from front to back. He would occasionally stop on the first couple of rounds of the field to check the plowing depth. Then he would make adjustments to the lever on the land-wheel side of the plow. He was plowing corn stubble and there was no need for very deep plowing. However, the roots of the stubble were still very “green” because the corn plants had been cut off from the stubble only about a month prior. Thus the root systems were still very vigorous and tended to make plowing difficult as the plow bottoms tried to cut through this vigorous root system. To solve this problem, our Dryden Township farmer lowered the depth of the plow so that the bottoms would pass under the largest mass of roots of the corn stubble. Arriving at the other end of the field near the township road, our Dryden Township farmer reached around and gave the trip rope a little tug. The clutch on the land wheel side of the plow was set into motion and the wheels on the front of the plow lifted the bottoms out of the ground. Our Dryden Township farmer was pleased to see that the bottoms glistened in the afternoon sun. They had not lost their “land polish” over the summer. At the conclusion of plowing last spring he had smeared axel grease over the surface of each bottom to prevent the bottoms from rusting. Obviously, it had worked. Now as he pulled the tractor out and around to be headed back across the field along side the furrows he had just made on the first trip across the field. On the first trip across the field the front plow bottom had turned soil over on top of unplowed ground. Now as he drove the tractor around to head back across the field he drove the tractor so that the right rear wheel of the tractor rolled along on top of the soil that he had just turned over on his first trip across the field. This meant that the front bottom of the plow would now, not only be turning over the same soil again, but the bottom would also be plowing the un-plowed strip of soil underneath. He needed to re-arrange the levers of the plow to get sufficient depth and to keep the plow level as it moved back across the field. Plowing these furrows toward each other like this tended to create a ridge of soil that extended all the way across the field. This was known as a “dead furrow.” Another form of dead furrow was created as a slight gulley when adjacent furrows were turned away from each other. These dead furrows were inconvenient, but were necessary in order to get all the soil in the field plowed. When he reached the near end of the field again and raised the plow bottoms and turned the tractor around again and drove the tractor up to the side of the plowed ground, he positioned the tractor so that the right rear wheel of the tractor was in the furrow on that side of the plowed ground. Then he tripped the plow again and set about adjusting the levers again. The tractor moved along across the field with a slight “list” to right side because the right rear wheel of the tractor was rolling along in the furrow while the left rear wheel was up on top of the ground unplowed ground. Although the tractor was listing to one side, our Dryden Township farmer adjusted the levers so that the plow was operating level from side-to-side despite the slight tilt of the tractor. Once again he adjusted the depth of the plow so that the bottoms would pass under the thickest part of the root mass of the corn stubble. When these adjustments were set, our Dryden Township farmer was able to plow continuously across the field and back again, merely raising the plow and turning around that the ends of the field and tripping the plow again. There was no real need for any further adjustment of the levers. Once set the plow would return to the same depth of plowing and to the same level setting each time the plow was tripped without any further adjustment. Our Dryden Township farmer wanted to get this manured portion of the corn stubble plowed quickly so that the chicken manure could be thoroughly incorporated with the soil and be ready for the oats in the spring. To wait might allow the rich chicken manure to be lost through water “run off” or evaporation into the air before spring. Plowing was locking the value of the chicken manure into the soil to prevent such loss. He kept plowing the corn stubble until the manured portion of the stubble ground was all plowed. Going up one side of the plowed land and returning on the other side, the plowed ground grew by 28 inches on each crossing of the field and 56 inches upon the completion of each round. By milking time that evening, he had plowed all the ground over which the chicken manure had been spread. Now he could be sure that all the nutrients in that rich chicken manure were worked into the soil and would stay in locked into the soil and be available as plant nutrients for the oat crop next spring. While he was working in the field our Dryden Township farmer’s wife was busy sweeping out the hen house. Then she set about with a bucket of water containing a strong lye solution and a broom, to wash down the entire chicken house. She cleaned all the waterers and the feeders with the lye solution. This lye solution ridded the hen house of any residual bacteria or germs from the old flock. The hen house was then a clean environment into which the new chickens would have a clean start. Then she let the waterers and feeders dry outside hen house in the sunshine of the September Indian summer weather. The next day after the morning milking chores, our Dryden Township farmer loaded a bunch of ground corn cobs up into the narrow double box of his wagon. Then he drove the wagon over to the hen house where he and his wife loaded bushel baskets full of the ground corn cobs and started spreading the ground corn cobs on the floor of the hen house a basket-full at a time. They wanted the covering of corn cobs on the floor to be about three or four inches thick. Once the floor was fully covered with sufficient bedding, they moved the clean feeders and waterers back into the hen house and loaded the feeders with corn and oats and put water in all the waterers. She purposely did not feed the young chickens that day, as she usually did. Instead, she left the door to hen house wide open. Some of the chickens noticed the open door and entered and found the feed. Their happy conversational cackling soon caused other chickens to enter the hen house and eat. Towards evening she again poured out more oats and corn in the feeders. While they were busy eating she closed the door of the hen house. About half of the young chickens in the yard were enclosed in the hen house by this method. The rest of the chickens needed to be gathered by her and her husband. Our Dryden Township farmer’s wife removed the four empty milk cans from the big wheel push cart she ordinarily used for the carrying the daily water from the windmill to the hen house. (For a description of these daily chores, see the first article in this series carried in the January/February 2009 Belt Pulley magazine.) She then stacked two chicken crates one on top of the other in the push cart. She and her husband would attempt to fill the crates with chickens gathered in the yard and transport them to the newly cleaned hen house. The easiest place to gather the most chickens at once was the brooder house. Even at this age, many of the young chickens habitually returned to the familiar surroundings of the brooder house to roost at night. However, these chickens would have to wait until last. Our Dryden Township farmer and his wife quietly closed the door of the brooder house and the small door to the wire porch. The chickens sleeping on the roosts inside the brooder house were now trapped. Our Dryden township farmer and his wife wanted to gather the young chickens that were roosting in the trees around the yard before the squawking and commotion of gathering chickens awaken all the chickens in the whole homestead and sent them running off wildly in all directions. Our Dryden farmer got the step ladder and set it up under a low branch of the one tree where three or four young chickens were roosting. Quietly climbing the step ladder he was able to capture all three by the legs and hold them upside down as he descended the step ladder. They squawked and flopped their wings until he locked them safely up in the first chicken crate. Unbelievably some chickens roosting on a branch on the other side of the same tree had not been awakened yet and our Dryden Township farmer was able to gather them too by using his step ladder. Our Dryden Township farmer’s wife stood by with a “chicken hook” in hand. A chicken hook was a piece of heavy wire that was about four feet long with a wooden handle attached to one end. The business end of the chicken hook was fashioned into a long narrow hook. The hook was shaped so that it would fit around the thin lower portion of a chicken’s leg. Once hooked a chicken could not run away because the foot would not slide through the hook. Our Dryden Township farmer’s wife intended to use the chicken hook to snare any chicken that awoke from its slumber, jumped down from the tree limb and tried to run away. Our Dryden Township farmer was aware that he could snare the chickens on the limb of the tree with the chicken hook and pull them down. However, he remembered his father’s admonition against this method of gathering when he was still a child on his parent’s farm. His father warned him that the chickens might be injured as they were jerked awake and fell to the ground. Accordingly, he now preferred to get up near the chickens and gather them by hand. Thus, they moved around the yard that night gathering chickens in the moonlight. They looked carefully up in all the large trees in the yard. They checked the barn and the hay mow for chickens roosting. Then they went to the brooder house and slowly opened the door. They quickly gathered up the chickens roosting there and brought all of them to the hen house where they were released to become acquainted with their fresh new surroundings. The chickens had been laying eggs in the yard. These could not be gathered and were unmarketable pullet eggs. Now, however, in the hen house with the properly balanced feed and supplemental calcium available, the chickens would enter the age when their production of eggs would reach its peak. All winter the eggs from the hen house would add substantially to the farm income of our Dryden Township farmer and his wife. This was an income that did not require our Dryden Township farmer or his wife to transport the eggs to market. The Noacks Company “egg truck man” kept arriving on the farm every Wednesday and Saturday regular as clock-work to pickup the eggs they had ready for market. Unforeseen by our Dryden Township farmer were the vast changes that would occur to the nation in the years just ahead. Starting in June of 1941 the increasing demand for eggs drove the price of eggs up as the United States began to supply food stuffs for the Soviet Union, China and England and other belligerents in the current, ever-widening world war. From the usual average price of 20.4¢ per dozen the price moved up to 25.5¢ per dozen in July of 1941. Then in December the United States unexpectedly entered the war as Pearl Harbor was attacked. Eggs were needed in large quantities by the United States Army as they fed soldiers and sailors around the world. These eggs were delivered to the front as “powdered eggs” in K-rations. Once at the front the eggs were reconstituted with boiling water into a form of scrambled eggs. Reports indicate that these reconstituted eggs were not for everyone and were definitely an acquired taste! Nonetheless the price of eggs that our Dryden Township farmer’s wife received for her eggs rose to 34.8¢ as an average for the whole month of December 1941 and the price kept on rising throughout the war. This huge demand for eggs led many persons to start raising chickens. This in turn spawned many other businesses. By 1943, there were 12,000 nurseries in operation across the United States, busily hatching eggs for future laying flocks that were in demand everywhere. (Pam Percy, The Complete Chicken [Voyaguer Press: Stillwater, Minn., 2002] p. 32. All throughout the war, the increased profits obtained from rising egg prices was definitely aided by the fact that our Dryden Township farmer had mechanized his farming operation with the purchase of the Little Genius tractor plow. He was able to accomplish the plowing his fields much more rapidly with the McCormick-Deering Little Genius plow and the 1935 Farmall model F-20 than he ever had with his horses. Furthermore, the Little Genius plow was able to turn over the sod better than other plows. Corn stalks and other trash on the surface of the ground was efficiently rolled under the ground much easier with the Little Genius plow. The result was a cleaner field when it came time to prepare seed bed in the spring of the year. Like all other farmers in the United States during the Second World War, our Dryden Township farmer found it difficult to obtain new farm machinery during the war. When the war ended, many farmers who owned pre-war tractors with steel wheels employed local blacksmiths to cut down the steel wheels of their tractors and had them fitted with rims for rubber tires. Our Dryden Township farmer, however, decided to trade in his old 1935 Farmall F-20 tractor to his local IHC dealer—Thomes Bros. Hardware in Arlington, Minnesota—as part of the purchase of a new post-war Farmall Model H tractor. Like the F-20, the Model H was a two-plow tractor. So he continued to use the same Little Genius plow with the Model H. However, he did have to make an adjustment to the plow’s triangular hitch to “tune the plow” to the new Model H tractor. Furthermore, in 1947, our Dryden Township farmer decided to take the steel-wheeled Little Genius plow uptown to the Gustave Knapp blacksmith shop in Arlington, Minnesota. Gus Knapp had just moved into his new building in the Spring of 1947 after a fire had destroyed his old blacksmith shop in the fall of 1946. Our Dryden Township farmer wanted Gus to cut down the steel furrow wheel of the plow and fit the wheel with a rim for a 6.00 x 16 inch tire. The reason for this provide a permanent fix to the problem of soil building up on the rim of the steel furrow wheel while plowing. As noted above, the temporary solution had been to slide an old blown out tire over the steel wheel on furrow side of the plow. Cutting down the wheel to be fitted with any old car tire would permanently fix this problem. Accordingly, the furrow wheel on the plow was cut down to be fitted with a rim for a 6.00 x 16 inch tire. The 6.00 x 16 inch tire was the most common size car tire in the post-war era. It was thought that any farmer would be able to find an old bald 6.00 x 16-inch car tire that could be mounted on this particular rim. However, to provide some balance to the plow, our Dryden Township farmer also had Gus cut down the steel wheel on the land side of the plow. The steel wheel on the land side of the little Genius plow was, however, larger in diameter than the furrow wheel. The land wheel was the wheel connected to the clutch of the plow which lifted the plow mold board “bottoms” out of the ground when the trip rope was pulled at the end of the field. Consequently, it was thought that a larger diameter wheel was needed to provide more traction and leverage to pull the plow out of the ground in some heavy soil conditions, where the surface of the ground was slippery. This situation arose when plowing in succulent green vegetation. The outer surface of the land side wheel would become slippery from the succulent plant life crushed under the land wheel. Then when the trip rope in pulled the land wheel might slide along the surface of the ground rather than turning and lifting the plow out of the ground. A larger wheel on the land side of the plow would provide more leverage under these slippery conditions and would reduce the tendency of the land wheel to skid along the surface when the trip rope was pulled to lift the bottoms out of the ground. Since a rubber-tired wheel would also get wet as it rolled over succulent green plant life, a rubber-tired land wheel would also have the tendency to skid along the surface of the ground under slippery conditions. Accordingly, it was decided that the land wheel should be cut down to be fitted to a 19 inch tire rather than a 16 inch tire like the furrow wheel side of the plow. A 4.75 x 19 inch tire was chosen for mounted on the 19 inch rim for the land side wheel. Although during the war and in the immediate post-war era, the 6.00 x 16 inch tire was the most common tire size available on automobiles, the 4.75 x 19 inch tire was also a very common tire size which had been used on a number of cars in the pre-war era, e.g. the 1930 and 1931 models of the Ford Model A car, the 1930 and 1931 Chevrolet car and the 1929 through 1931 Plymouth cars had all been fitted with 4.75 x 19 tires. Accordingly, it was thought that even in the post-war era a farmer might easily find one of these old tires quite easily to have mounted on land wheel of his plow. Since the mid 1930’s, IHC had offered their McCormick-Deering Little Genius to the farming public with the option of rubber tires. IHC contracted with the French and Hecht Company (F. & H.) of Davenport, Iowa to supply all the rims IHC needed for mounting on Little Genius plows which were to be equipped with rubber tires. F. & H. supplied their trademark “round-spoke” rims for this contract with IHC. A 1941 picture of the showroom floor of the Taylor Bros. Implement dealership of Johnsonville, Illinois, shows what a brand new Little Genius plow with would have looked like with factory-installed rubber tires. (This picture first appeared in the November/December 1993 issue of Red Power magazine.) In that picture, a Little Genius plow is seen on the showroom floor with a 6.00 x 16 inch rubber tire on furrow side and a 4.75 x 19 inch rubber tire mounted on the land wheel side. Both tires are mounted on F. & H. appropriately-sized round-spoke rims. As noted in an earlier article called “The McCormick-Deering Little Genius Plow” carried in the September/October 1994 issue of Belt Pulley magazine, when Gus Knapp cut down the round-spoke steel-wheels of this particular plow owned by our Dryden Township farmer, the result was that this plow came to look exactly like the Little Genius plow shown in that 1941 photo of the Taylor Bros. Implement showroom. By cutting the steel wheels down to fit rubber tires on the plow, Gus Knapp and our Dryden Township farmer made the plow look exactly as the plow would have looked if in had been sold new in the pre-war era equipped with the optional rubber tires. Once the front wheels of the plow were cut down and fitted with appropriate rims for rubber tires on the front of the plow, the only clue that remained indicating this plow was originally a steel wheeled plow was the steel trailing wheel at the rear of the plow. Our Dryden Township farmer continued to use this Little Genius plow, now fitted with rubber tires, on the farm where he and his wife continued their diversified farming operation including the raising of laying hens and selling of the eggs. However, by the mid-1960s small chicken raising operations started disappearing from the scene of North American agriculture. The raising of chickens for eggs and/or for meat became the domain of much larger confinement operations of 2,000 chickens or more. No longer were small flocks of 200 laying hens profitable. So our Dryden Township farmer’s wife ceased raising chickens and a few years later she and her husband retired from farming altogether. Together they moved into Arlington to live. At the retirement auction of our Dryden Township farmer, someone purchased the 2-bottom Little Genius plow. The plow did not bring much money because, by the 1960s, the plow was regarded as a very small piece of equipment in light of the size of mold board plows employed in the late 1960s. As noted in the first article in this series (the article called “A McCormick-Deering ‘Little Genius’ Plow in Dryden Township [Part I]” contained in the January/February 2009 issue of Belt Pulley magazine), the plow was again put up for sale in 1974 or 1975. By this time the little plow was even more outdated because the practice of mold board plowing, itself, was being abandoned by farmers as a practice that caused excessive soil erosion. This time, as noted in that first article, the little plow was purchased by Delmar Trebesch who intended to use the plow in his large garden on the farmstead where they lived in Arlington Township, the township immediately east of Dryden Township in Sibley County, Minnesota. Accordingly, the Trebesch plow came to be parked in the grove of trees on the farmstead in Arlington Township when Larry Hiles moved onto the farmstead. On the last weekend of April of 1993, Larry Hiles loaded the plow up with some other farm equipment and took the equipment to the LeSueur County Pioneer Power Swap Meet held on Saturday April 24, 1993. There the Trebesch plow was sold to Mark Wells. Scenes of the plow under going initial cleaning and repairs at the 1993 Swap Meet can be seen in the second hour portion of the Disc/Tape No. 5 of the International Harvester Promotional Movies Collection. In those scenes, the plow is shown being pulled by the 1937 Farmall Model F-20 bearing the serial number 71355. This particular tractor is the same tractor that was purchased by Wayne A. Wells a year earlier at the LeSueur County Pioneer Power Swap Meet held on April 25, 1992. Consistent readers of the Belt Pulley magazine will recognize that No. 71355 was the subject of the two-part series of articles contained in the July/August 2008 and the November/December 2008 issues of Belt Pulley magazine. No. 71355 is the tractor to which the Trebesch plow was to be matched for purposes of exhibition and field demonstrations at the showgrounds when the plow became a permanent exhibit at the LeSueur County Pioneer Power Show held annually on the last weekend in August. During restoration and painting of the Trebesch plow which was begun on August 22, 1993, appropriate adjustments made to the triangular hitch of the Trebesch plow to straighten the imaginary line of draft both horizontally, and vertically when hitched to No. 71355. The result was that the Trebesch plow was “tuned” precisely to the F-20 tractor bearing the serial number 71355. This meant that the Trebesch plow would operate at top efficiency under all plowing conditions when hitched to N. 71355. This peak efficiency was demonstrated a year later at the 1994 LeSueur County Pioneer Power Show, when on August 28, 1994 No. 71355 pulled the Trebesch plow in a plowing demonstration at the Show. No. 71355 pulled the plow straight across the field without any tendency toward wasteful “side draft” of the front end of the tractor. Indeed, No. 71355 and the Trebesch out-performed many newer, post-war tractors with “integral” or mounted plows in the wet plowing conditions that existed at the 1994 Show. No. 71355 and the Trebesch plow easily “walked” across the field with very little or no slippage of the rear wheels of the tractor while other more modern tractors and plows were spinning out due to the wet plowing conditions. As part of the restoration of the Trebesch plow, the steel trailing wheel on the rear of the plow was also replaced with a rubber-tired trailing wheel. As a consequence, the Trebesch plow now appears exactly like a Little Genius plow that came from the factory in the pre-war era fitted entirely with rubber tires. Matched with the 1937 rubber tired tractor (No. 71355), the Trebesch plow looks as though it could have been sold together with No. 71355 in the pre-war era—a pair of pre-war rubber-tired farm implements tuned exactly to each other. The tractor and plow are, in themselves, a scene from the pre-war era and they are a tribute to pre-war diversified farming of the Midwest, when most of the eggs (and chickens) produced in the United States were from small flocks of around 200 birds raised as a part of a diversified farming operation. The Trebesch plow and its companion tractor, No. 71355 will remain an enduring symbol of small diversified farming in that earlier pre-war era. I am very much interested in tracking down a copy of the 1949 film “Honeymoon for Harriet,” sponsored by International Harvester. You see, I’m from the Kansas City area and I’ve been researching the history and output of the Calvin Company, a KC studio that specialized in 16mm industrial and educational motion pictures, including many for International Harvester, Caterpillar, John Deere, etc. Calvin produced “Honeymoon for Harriet” for IH. I’ve been trying to track down as many Calvin productions as possible for viewing, and it isn’t easy. Most are extremely rare and difficult to find. What makes “Honeymoon for Harriet” perhaps even more interesting is that it marked the directorial debut of a young Robert Altman, who worked at Calvin in KC before “going Hollywood.” I noticed that “Honeymoon for Harriet” is one of the titles available on a set of DVDs for sale that are connected with your website. However, I was not successful in attempting to order and purchase it from there. I am aware that this inquiry is not pertinent to this particular article, and for that I apologize. Yet I would greatly appreciate any help in getting my hands on that DVD.